Vessel sinks have many benefits regarding function and style. In addition to making a bathroom more spacious, they add an interesting and timeless look that keeps your bathroom relevant. But whether they’re glass, marble or stone, vessel sinks need to be cared for properly. Here are a few expert tips on maintaining and cleaning your unique sink so that it withstands the test of time. Vessel sinks have been a go-to choice for interior designers and homeowners because of their striking and elegant appearance. They differ from traditional sinks because they sit on top of the vanity or countertop in the bathroom, Cheryl Khn at The Spruce explains. This means that, unlike drop-in sinks, they are much easier to install. Vessel sinks can make a room appear larger, since they need to be mounted on slightly lower vanities. This increases the illusion that the ceiling is higher and, therefore, makes the room feel bigger. This is especially true with glass sinks, explains the team at fixture designer Native Trails. Since you can see more of the room and countertop through the transparent sink, glass vessels make a bathroom feel larger. Vessel sinks add a unique design touch to your bathroom. With proper maintenance, you can ensure that your sink stays pristine and useable for years to come. Regular cleaning is important as it prevents permanent damage incurred by stains, spots and rust. Understanding what causes these spots can help homeowners become more proactive about keeping their sinks clean. “These spots arise when calcium and magnesium in the water react with soap and chemicals in the bathroom, leaving behind a hazy residue,” Hunker’s Charlotte Johnson explains. While the aftermath can be quite unsightly, preventing and cleaning these spots is quite simple. For example, wiping away the water spots in your sink at the end of the day can prevent staining. 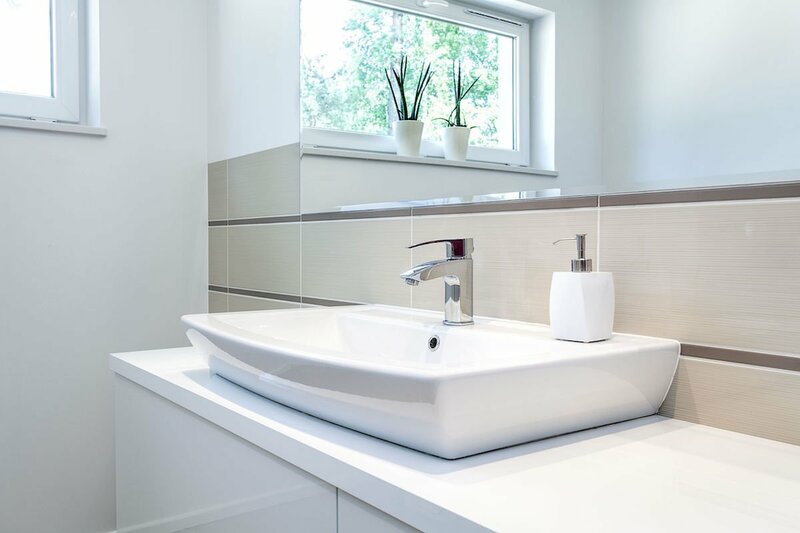 The team at MR Direct, a sinks and faucets supplier, writes that homeowners should wipe water from both the inside and outside of the sink. This can be done on a daily basis, but also before a deeper clean. 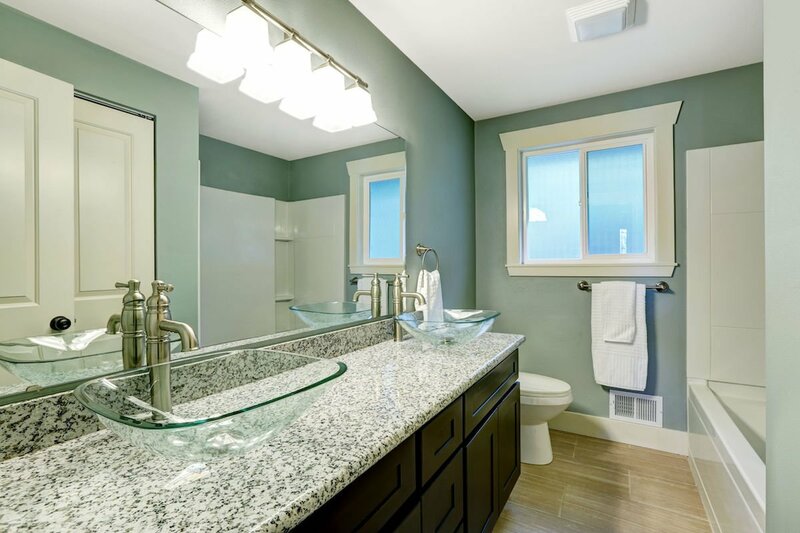 If you have a glass vessel sink, cleaning it is fairly straightforward. Since glass is non-porous, it doesn’t keep stains and bacteria on its surface, CBD Glass Studios explains. The main thing to keep in mind when cleaning your glass sink is to be gentle and wipe all away all traces of water and chemicals (if using a chemical-based cleaner). This ensures that your cleaning process doesn’t contribute additional stains to the sink. Cleaning a stone sink is quite different than cleaning a glass sink. This is largely due to the fact that stone is much more porous than glass. This means that certain substances can stain your sink more easily, according to unique sink retailer Rustic Sinks. They suggest quickly wiping up any calcium, salt, lime or detergents from the surface of your sink. The longer one of these materials stays on the sink, the deeper the stain can become. Wiping away stains on a regular basis can prevent the need for more intensive cleaning later on. If you do need to use something tougher, the sink experts at Sinks Gallery say it’s important to avoid abrasive cloths. This includes steel wool and metal brushes as well as scouring powders and creams with scrubbing agents. Additionally, harsh cleaning products, such as those that are acidic or contain ammonia, should also be avoided. Even some dish soaps contain agents that can be abrasive. What cleaners should be used instead? For daily upkeep, simply wiping away water is a great place to start, according to Stephanie Vozza at Use Natural Stone. It’s also important to be careful with leaving soap on the countertop. Soap can leave a residue if it stays on the sink for too long, so bars of soap should never be placed directly on the edge of the sink. If you notice that your sink has developed an odor, Alexandra O’Brien at RealEstate.com.au offers fix. First, pour one half cup of baking soda down the drain, then heat four cups of vinegar and pour two into the drain. Let it bubble, then run cool water into the sink, and pour the remaining vinegar down the drain. Repeat this process as many times as necessary until the odor is gone. Natural Stone provides a helpful guide for removing stains based on their components. For example, cosmetics can leave an oil-based stain which will need to be chemically dissolved with the right product so that the stain can be rinsed away. Granite composite sinks can also experience what’s called white haze. This haze is essentially a film on the surface of the stone, due to the buildup of minerals and other deposits. It can be avoided by wiping out the sink on a daily basis, Supreme Surface Cleaners explains. If the buildup has already occured, the haze can be removed with the help of a professional stone care product. When using a new stone care product for the first time, bathroom retailer Beaumont Tiles suggests testing it out on an inconspicuous area first. Conducting a sample cleaning on a small area can ensure that the product is right for the stone. Sealing your vessel sink can ensure that it stays protected from mineral and chemical deposits. How you seal your sink depends on what your sink is made of. While granite has a higher absorption rate than polished marble, limestone can be extremely absorbent. “The higher the absorption coefficient, the more difficult it will be to seal the stone adequately,” writes Tech Stone, a stone maintenance and restoration company. You should also understand the different types of sealants available to you: coating sealers and penetrating sealers. The difference between these two sealants is explained by Stone Care International: Coating sealers add a protective layer to the granite surface; penetrating sealers seep into the pores of the stone and tend to last longer. Rather than using any random sealer on your sink, choose something specifically meant to seal that material. The sealer you use will be determined in part by the type of stone in your bathroom. While engineered stone is usually already sealed and stain-resistant, natural stone requires a bit more upkeep. Light colored granites will be more susceptible to stains than dark, according to Accent Benchtops. Resealing the stone every few years will keep your vessel sink looking great, no matter how old it is.